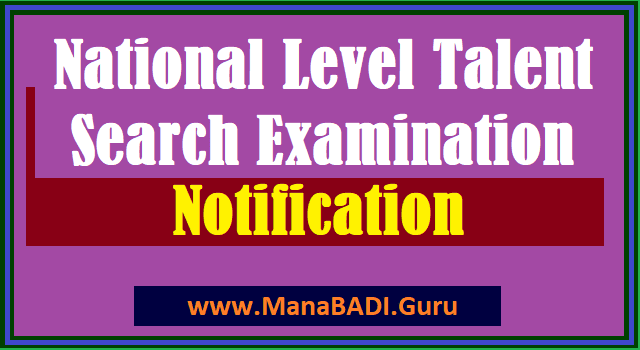 Telangana/TS NTSE 2017 Notification for Class X: The state level National Talent Search (first level) Examination 2017 Notifications would be issued soon by the office of the Director of Government Examinations, Telangana State in August 2017. The State Level National Talent Search 1st level Examination for 10th class students will be conducted on 05-11-2017 (Sunday) from 10.00 AM to 01.00 PM in Telugu/ Hindi/ Urdu and English media at all the Head quarters of 10 Districts in the State. The students who are studying X Class during the current academic year i.e., 2017-2018 in any recognized school in Telangana State, including Kendriya Vidyalayas and schools affiliated to I.C.S.E. and C.B.S.E., New Delhi are only eligible to appear for the above said Examination. The students who have selected for NMMS scholarships and studying X class now may also eligible for NTS Examination but such candidates have to forego the further NMMS scholarships, if he/she are selected in NTS Examination. The National Talent Search Examination will be conducted for students studying at the Class X level. The examination consists of tests, namely Mental Ability Test (MAT) and Scholastic Aptitude Test (SAT). The items in the MAT and SAT are multiple choice questions. Each question has four alternatives. The candidate has to select one correct answer from the given alternatives and mark its number in the answer-sheet as per instructions given on the answer sheet. Each correct answer carries one mark. Thus, the total score of a candidate in a test is equal to the number of questions answered correctly by him/her. 3. Scholastic Aptitude Test(SAT) for 90 marks comprising Social sciences, Sciences and Mathematics. Language Comprehensive Test will be qualifying in nature and marks will not be added for deciding final merit list of the candidate and not to be added in the grand total. There will be two-stage selection process for award of scholarship to class X students of AP. For Stage I, selection will be done by the both states of AP through NTS first level examination November-2017. The Students of AP, who qualify Stage-I, will be eligible to appear for Stage-II examination, conducted by NCERT. The application form and other information can be obtained from the concerned District Educational Officer or from the under signed. Application forms can also be downloaded from the state's website www.bseap.org and filled-in application form should be submitted in DEO's office of the District concerned only. For any further details in this regard the concerned District Educational Officer or Office of the Director of Government Examinations, Hyderabad. Telangana State may be contacted. 1. The candidate / Principal of the school must confirm the last date for submission of Application Form from the state liaison officer and Application(s) must be submitted before the last date to the concerned District Educational Officer. 2. The candidate / Principal shall get confirmed the name of examination centre from the DISTRICT EDUCATIONAL OFFICER. 3. Last Date for remittance of examination fee by the candidates / Head Master or Head Mistress: 01-09-2014. 4. Incomplete/ wrongly filled-in application is liable for rejection. #GOVERNMENT: A Government School is that which is run by the State Government or Central Government or Public sector Undertaking or an Autonomous Organization completely financed by the Government. #LOCAL BODY: A Local Body School is that which is run by Panchayati Raj and local body institutions such as Zilla Parishad, Municipal Corporation, Municipalities, Notified Area Committee and Cantonment Board. #PRIVATE AIDED: A private Aided School is that which is run by an individual or a private organization and receives grant from the Government. #PRIVATE UNAIDED: Private Unaided School is that which is managed by an individual or a private organization and does not receive any grant from Government. The following are the due dates for remittance of Examination fee and for submission of applications.